They found love right where they were. Through the meandering halls of Tribble to the silent corners of Z. Smith Reynolds Library, the array of nooks and crannies at Wake Forest teems with memories. With each new year, memories are made and shared, sometimes of love that can last a lifetime. 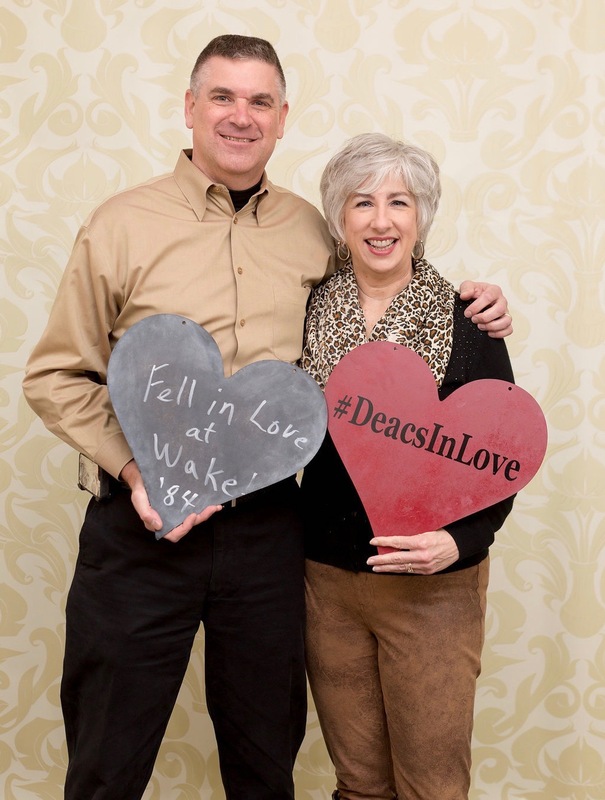 To celebrate their own love stories, 41 Deacon couples returned to campus Feb. 17 for Deacs in Love, hosted in the Magnolia Room by the Office of Alumni Engagement. 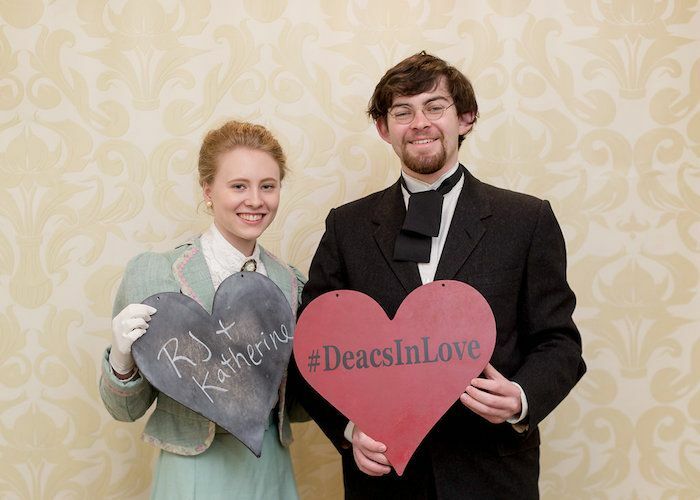 Emma Szuba, a sophomore from Sewickley, Pennsylvania, dressed as Katharine Reynolds, and junior Caleb Cabiness of Archdale, North Carolina, dressed as R. J. Reynolds, and they read aloud love letters the couple wrote in the early 1900s. “I feel that I just must write a word of love whether you see it or not, for thoughts of you are ever in my heart and prayers,” Katharine wrote. The Deacs in Love couples listened intently to the students, members of the Anthony Aston Players, a student organization dedicated to the promotion of theatre arts. 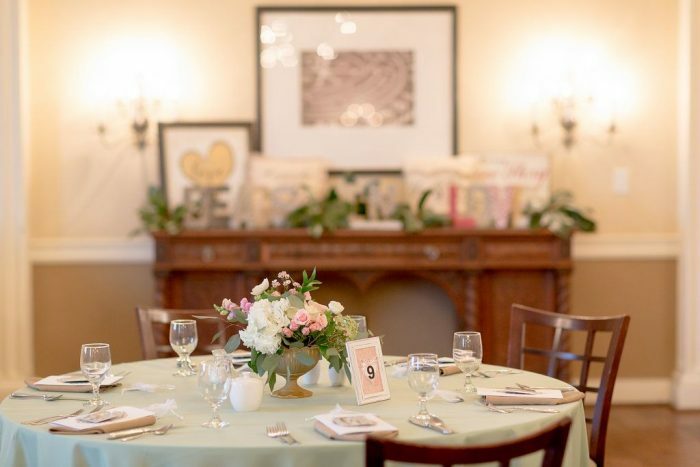 The exchange set the stage for a champagne brunch and offered a nod to the centennial celebration of Reynolda House, the 64-room country house that R.J. and Katharine Reynolds envisioned and moved into in 1917. Its gardens have fostered Wake Forest marriage proposals through the years. 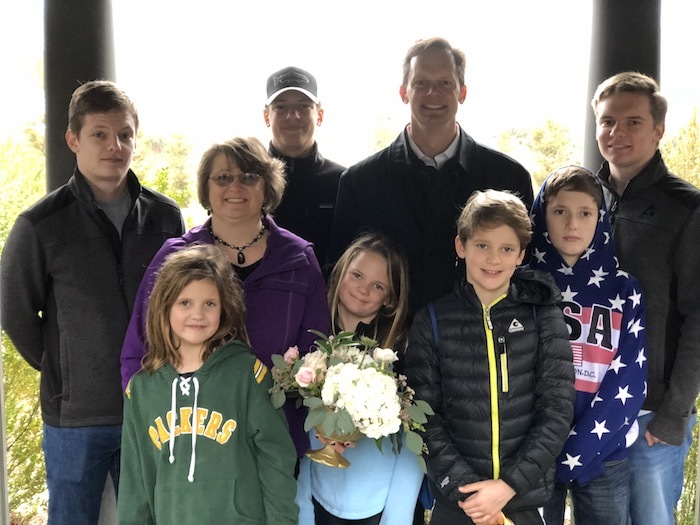 Jeff Titherington ('92) and Ali Preston Titherington ('92) and seven of their eight children. Wake Forest records estimate that there are about 4,220 alumni couples. Jeff Titherington (’92) and Ali Preston Titherington (’92) of Matthews, North Carolina, were among the alumni couples at Deacs in Love. They didn’t get married in Reynolda Gardens, but they renewed their vows in the gardens Saturday, with seven of their eight children watching. 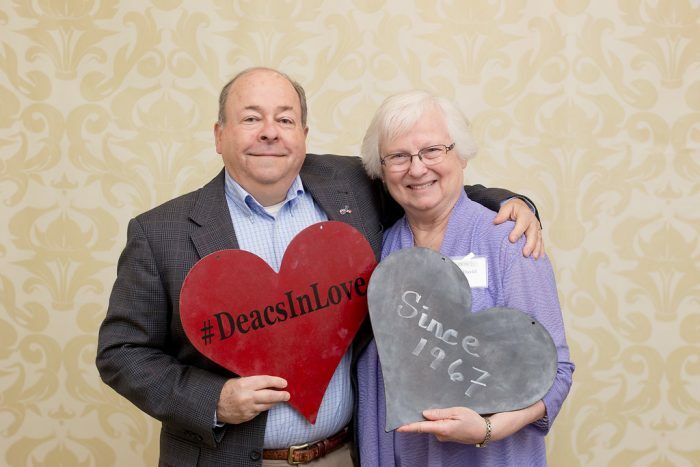 Chester David (’68) and Susan House David (’70) celebrated their 50th wedding anniversary at Deacs in Love. As they reflected on their time together, they shared how they actively honor their commitment to one another. Each week for 50 weeks, Chester and Susan are doing something to honor their lives together. 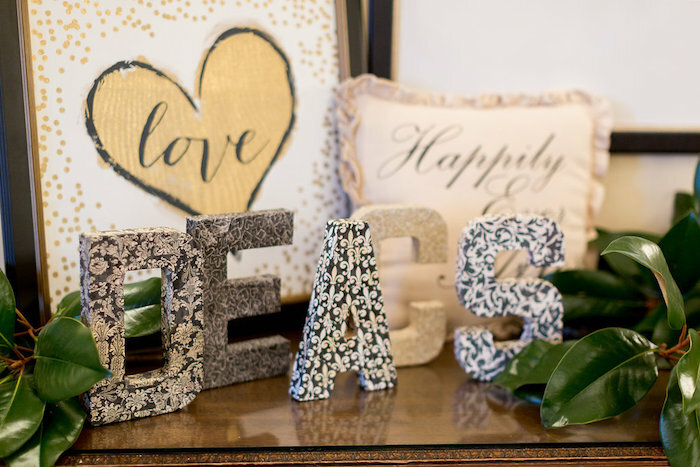 Whether it is something small like going to hear a live band or something special like preparing for the arrival of their first grandchild — due in June — Chester and Susan remind themselves of how far they have come and their ongoing commitment. 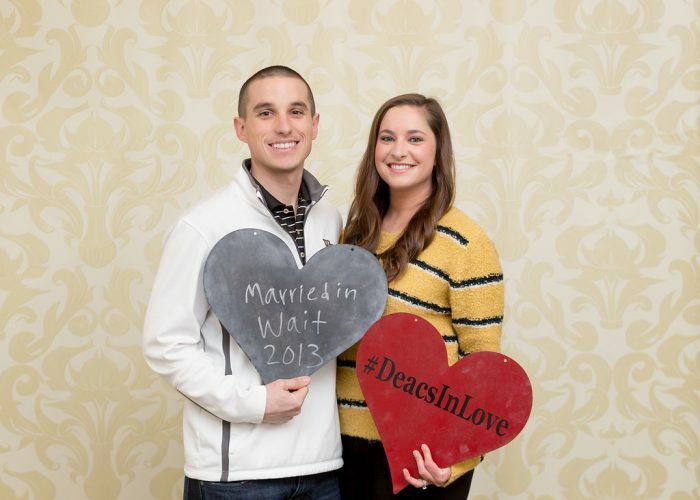 Deacs in Love served as one week’s event in their 50-week celebration. Back in the early 1960s, the Rev. 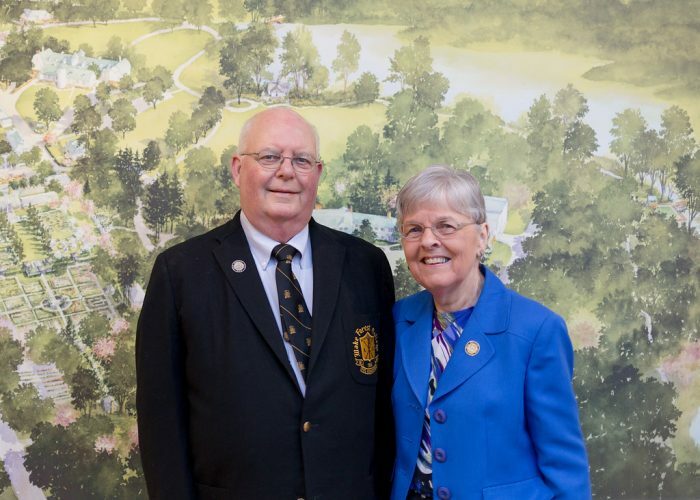 Joe Clontz Jr. (’64) and Eva Pearce Clontz (’64) were only good friends at Wake Forest. Then came a seminar in New York City during spring break of their sophomore year. They fell in love. “I get to be with the love of my life all of the time,” Joe said. He and Eva have been married 52 years. 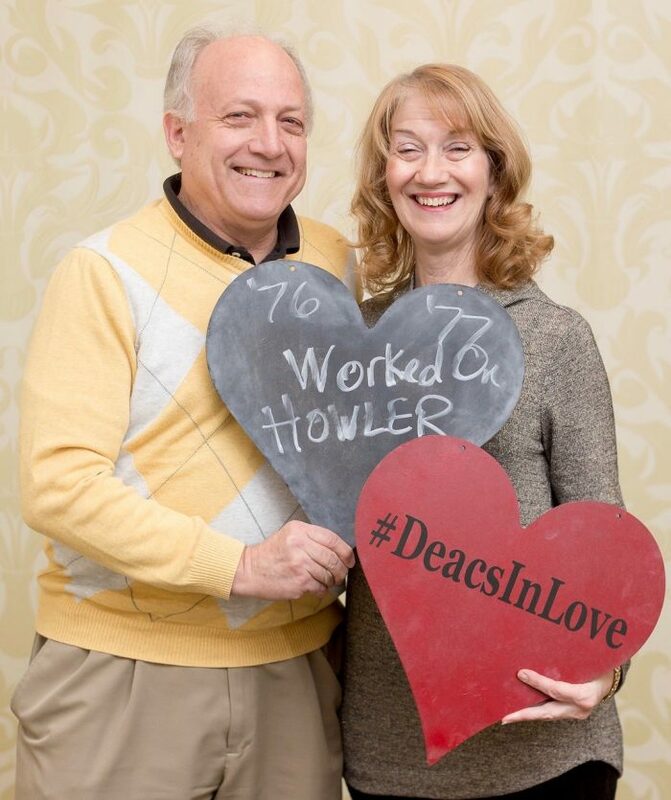 For one Deac couple, who met on Pub Row on the Howler staff, the first date was unforgettable. “Midnight dinner at Denny’s!” said Kathie Amato (’77, P ’08, ’11.) Leaving campus for good was not an option for her or the man who would become her husband, Al Rives (’76, P ’08, ’11). After moving away after graduation, Al and Kathie knew that their connection to Wake Forest was too strong to ignore. Before long, Wake Forest drew them home when Al was hired as a chemistry professor. For David Bailey (’84) and Lisa Burgess Bailey (’85), their story began with a sprained ankle in 1983. As David crutched out of Student Health, Lisa was walking out of Reynolds Gym. She offered to drive him to get X-rays on Silas Creek Parkway, but she quickly learned she had a problem. She couldn’t drive a stick-shift. “You just press the pedals, and I’ll handle the shifts,” David told her. In 1984, they dined at Ryan’s Restaurant on their first date, appropriately on Valentine’s Day. They will celebrate their 32nd wedding anniversary in August. “Make sure you have fun at every stage. It’s too important,” David said, laughing as he recalled all the fun they have shared. Winston-Salem native Christine Nader Groner (’11) hoped one day to get married in Wait Chapel. On July 13, 2012, her Deacon sweetheart, T.J. Groner (’09, MSA ’10, MBA ’15), proposed. Immediately, Christine began calling for a spot on the waiting list for the wedding. Exactly one year later the couple married, not far from their favorite Village Tavern date spot, in the place Christine had long imagined: Wait Chapel.